increasing demand for artisan products. but this new frontier of automation might surprise you. 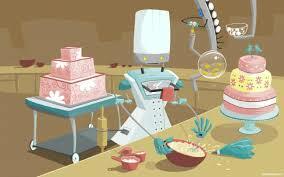 that robots can be artisan bakers too. and some videos on artisan bread scoring and proofing. Product quality and consistency, worker overuse injuries, the lack of quality labour and missed baking time windows in zonal oven loading were the key problems Tech Brew’s first system was designed to relieve. Technology Brewing designed a bakery robot system using a Kawasaki robot. The scoring robot automatically scores randomly positioned loaves with an ultrasonic knife according to user defined products. The robot locates proofed bread dough using 3D machine vision technology housed in a food safe enclosure. Knowing the exact location and 3 dimensional geometry of each loaf means that this robot can score relative to the top surface of each loaf at the exact desired score location and angle. It actually follows the curvature of the dough. Built specifically for the industrial bakery, this system is relatively compact, intuitive, easy to use and can be quickly installed to minimize production downtime. It comes with installation support and remote support features for those rare times that technical help is required. Industrial Baking robots not your jam?